A group of Geisha Girls unfurl their fans each spring in your garden – your Autumn Moon Maple has felt the warmth returning and has opened its leaves, in chartreuse green overlaid in shades of pink and orange. 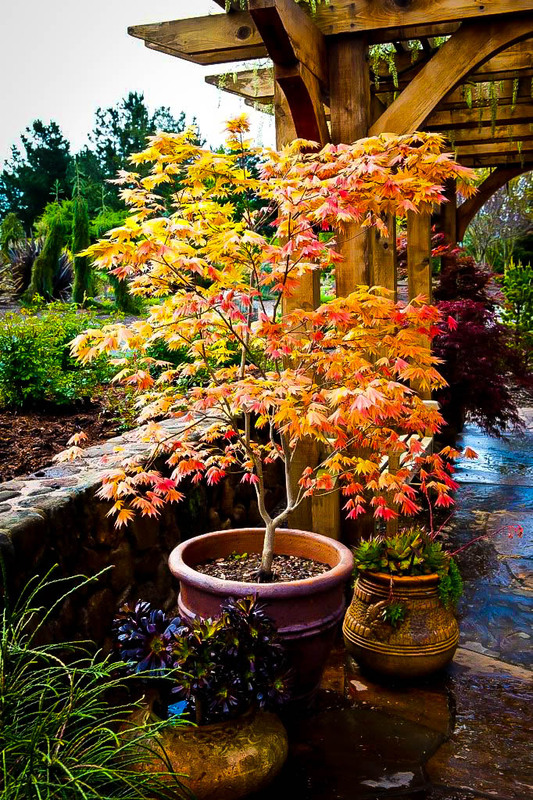 With much fuller and more rounded leaves, this maple has a remarkable ‘presence’ in any garden and is an ideal gift for the discerning gardener, who will now have a rare and special form of the Full Moon Maple, a highly-prized tree related to the ordinary Japanese Maple. Growing to 8 feet and in time to 15 feet, this tree will fill the garden with refined beauty, making any yard a special place. Not content with its spring display, the Autumn Moon Maple will burst out in fall with a firework display in reds and oranges that will set the garden ablaze. Just as easy to grow as regular Japanese Maples, this tree will grow in full sun in cooler regions, but prefer partial shade in hotter areas. With no pests and diseases and no need to prune it, all that is needed for this special beauty is some attention to summer watering. In return you will have something rare and very special that will always be the gift that keeps on giving. 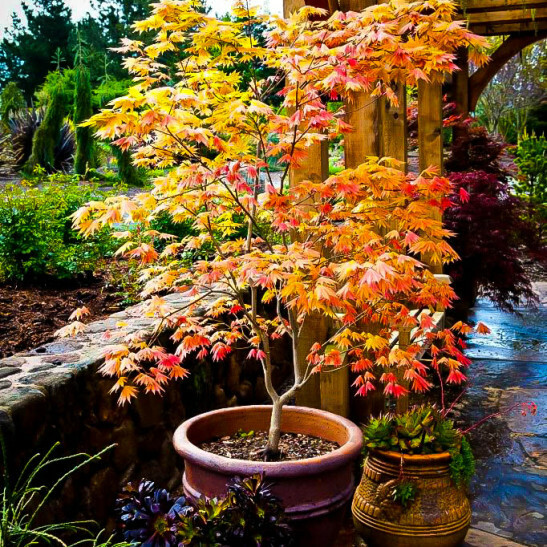 Japanese maples are certainly among the most beautiful and desirable small trees for the garden, so they make the perfect gift for a gardening friend, or for someone starting out with a new garden. 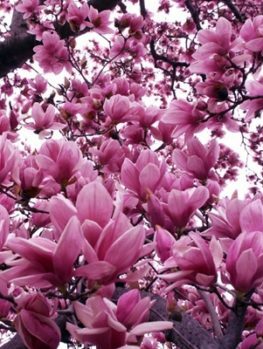 Their special beauty only grows richer and more attractive over time, as they expand and develop into plants of extraordinary beauty. With so many to choose from it can be hard to make a choice, but if you want to give something special, something rare and something not widely grown, then the Autumn Moon Maple is the perfect choice. In its early years, the Autumn Moon Maple will develop into a shrub about 8 feet tall and 8 feet across, but as it matures it will become a small tree, perhaps 15 feet tall and up to 18 feet across, with wide-spreading branches that are almost horizontal. Even when small this tree will enchant you with its delicacy and the unique form and colors of its leaves, although it is no more delicate that other Japanese maples, needing simply some shelter from the afternoon sun and some attention to watering during dry spells. 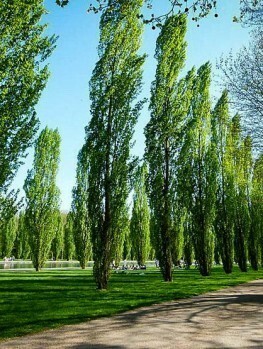 What is special about this tree begins with its foliage. Unlike other Japanese Maples, the leaves are not deeply cut, but much more rounded, with 9 pointed tips, rather than long fingers. The leaf is almost pleated, and reminiscent of a geisha’s open fan. To the Japanese eye its fullness is like the full moon, and they call it ooitayameigetsu, meaning ‘Full Moon Maple’. This tree is very hardy and more resilient in ordinary garden conditions than other Full Moon Maples. 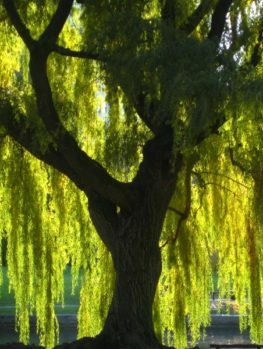 In spring the leaves unfold like a fan, in a wonderful shade of chartreuse green. But there is much more. Each leaf is misted with rich tones of pink to orange over that green, making an enchanting picture. In shady spots the color will be pinker – in stronger sun it will be more orange. The delicate stem of each leaf is a reddish orange, and the whole effect is utterly charming. In summer the leaves are mostly green – with young leaves still showing that beautiful pink or orange overlay, but in fall the Autumn Moon Maple pulls out all the stops and puts on a spectacular display of color in a wide range of fiery reds and sunset oranges. 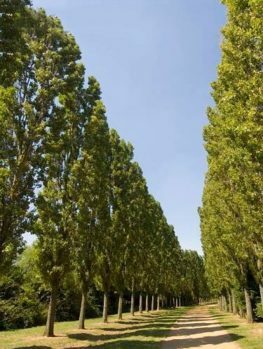 In a blaze of glory your tree will catch the attention of everyone and make your garden a very special place. Other special features to look for include the soft, white down that dusts the leaves when they first emerge and the tiny red flowers on mature trees, both features that distinguish this tree from ordinary Japanese maples. 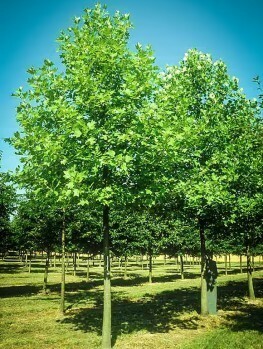 The ideal spot for the Autumn Moon Maple will have some sun, but be sheltered from the hottest afternoon sun in summer. 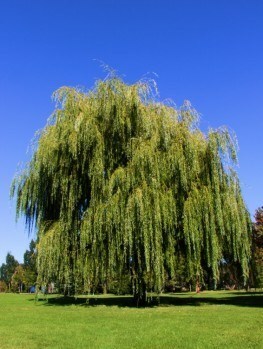 It will also grow in more shady conditions, but the colors will be more muted. Enrich the soil with plenty of organic material, as this tree benefits from a rich, moist soil that is well-drained. Use mulch over the root area to keep your tree happy during the summer and do not let it become completely dry, especially during the early years of its life with you. 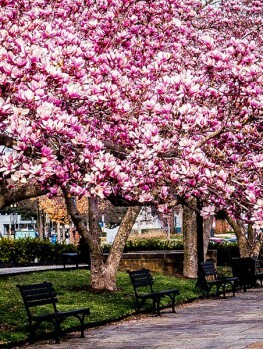 No pruning is required, and there are no significant pests and diseases found on this tree, so it is actually very low-maintenance and needs no special treatment to bring its charms to your garden. Allow enough room for its final size and look forward to your Autumn Moon Maple becoming a spectacular and rare addition to the garden. 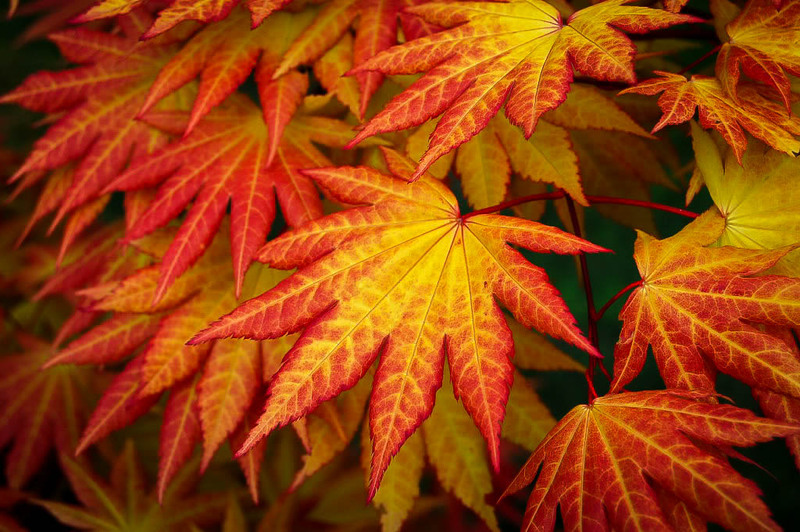 There are hundreds of different kinds of Japanese maples, but almost all of them come from the same species – Acer palmatum, a small tree native to Japan. This is not the only maple native to Japan however. There are several others and one that is highly-prized in Japan, but rarely found in America, is the Full Moon Maple (Acer shirasawanum). The Autumn Moon Maple is a selected form of the Full Moon maple. It has an interesting history. J.D. 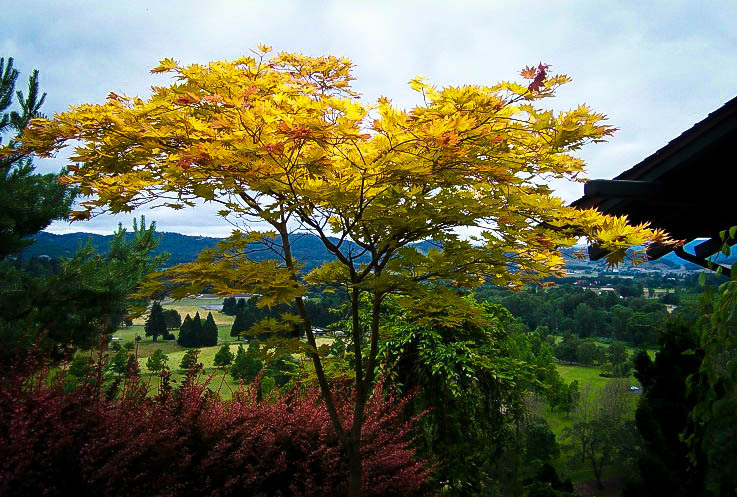 Vertrees was an avid professional gardener, who worked for his whole life to learn more about Japanese Maples. He owned Maplewood Nursery, in Roseburg, Oregon. Maplewood was a small, 1½ acre nursery, but there Vertrees built the largest collection of Japanese maples in the United States and wrote a classic book – Japanese Maples – built on his experience. One day – exactly when is not clear – he found among his many seedlings one that caught his trained attention. He nurtured this special seedling and in time that tree became the Autumn Moon Maple.